Women's Hairstyles for different Face Shapes & Hair Types. Hairstyle is the most Important Element in one’s Personality. It can make your Look either Worse or Amazing. You can Look Elegant even with average Looks if your Hairstyle is well chosen according to the Shape of your Face. It is very important to Select a Hairstyle, which is not only suitable with your Face Shape but also with your Hair Type. Here you can Easily View Hairstyles with Respect to Hair Type and Face Shape, and Select the one that Matches you. Following are some Women’s Hairstyles for different Face Shapes & Hair Types. If you have Round Face then you should go for Long Layers, specially if you have Straight Hair too. It will make your face look Elongated and hide the Puffy look too. Cheekbones will also be enhanced if you have Strong straight across bangs. If you have Square Face then you should choose such a Hairstyle that softens a Strong Jawline. So you must go for Shoulder Length hair with Layers that extend from chin to collar bone. Plus if you have Wide Forehead too then go for Side Swept Bangs to minimize it. If your face is Heart Shaped then try a Pixie that will make your Cheekbones prominent. You can also get Long Bob with some Long Layers. Also try to avoid Slicked Back Ponytail too because that it will not suit your delicate chin. People with Oval Shaped Face must avoid keeping Hair in same length as it will make the face Look even more Longer. You must try the Layers that start below the eyes because it will be a Face Fuller and your Looks will Improve. If your Hair are Curly and have a Round Face, then go for Long Layers as it will oppose the Pyramid Effect to maximum extent. Length of hair must be mid-neck to mid-back and you must get a deep side part too because it will emphasize the Bony Structure. Go for Shoulder Length Haircut and get Layers too that extend from ears to ends. For a Bouncy Touch in your hair, add few short layers in front of forehead that will fall over and make you Look better. You can also try Giving Rough Look to your Hair. 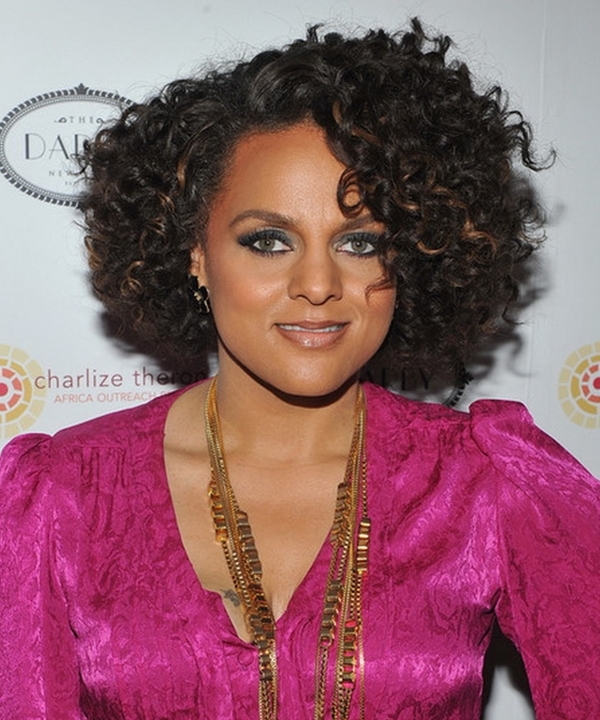 Curls must be full around the Shoulders and must be in such a way that it Balances the forehead’s width. You can get some front short Layers too. You can twist your Curls to give Rough Exposure and then hold it with some Clip. If people with Oval Face have a side part then it Enhances Cheekbones. Get haircut above the shoulders as it will increase your Good Looks. You can also keep your Hair Untied and let them cover the Sides of your Face. You should get Diagonal Layers as it will remove weight from the sides also a part helps to make the Face look Slimmer. Let your hair fall to chin or shoulders. You can also add Hair weight to one side to Make your Face look Slimmer. You should choose such a Hairstyle which is either above the chin or below it. If Cuts are ending at the Jawline then it will add width to your face. You can keep your Hair up above to add Grace. If you get Chin Length Bob then it will create flattering fullness around the Jawline. Avoid using razors as it will make the hair thin and create frizz. You can try giving Rough Touch to hair after keep them Moisturized. It will give attractive Look to your Hair. An Afro will give your face perfectly balanced look if you have Oval Face. You can get either Super-Short or Super-Full hair . If you want perfect look then make it tapered at the ears and Rounder on top. You can simply let your Hair fall on sides of your Face. There are Countless Hairstyles for Women. Most of the Women simply go for the Latest Trends which is Wrong. Because all Hairstyles are not for everyone. One Hairstyle that looks good on one Face, could Look Unattractive on other. So Always Choose the Hairstyle with respect to your Hair Type and Face Shape.